Tags: 2:18pm, 2:23pm, Bill Y, Bill Y "The Legendary Legend" Ledden #thelegendarylegend, funny, GIF, Humor Outcasts Bill Y Ledden, humoroutcasts, humour, I like tags, itsgoodtomock. 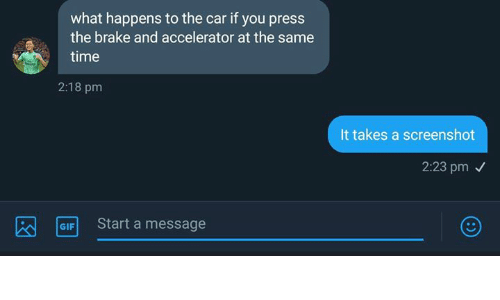 @itsgoodtomock, Screenshot..., Tags, what happens to the car if you press the brake and the accelerator at the same time? And you can post your predicament to FB.